Jean Reno, Gary Oldman, Natalie Portman and Danny Aiello star in Leon: The Professional, a go-for-broke thriller about a professional assassin whose work becomes dangerously personal. Calling himself a "cleaner", the mysterious Leon (Reno) is New York's top hitman. When his next-door neighbors are murdered, Leon becomes the unwilling guardian of the family's sole survivor - 12-year-old Mathilda (Natalie Portman), but Mathilda doesn't just want protection; she wants revenge. Training her in the deadly tricks of his trade, Leon helps her track the psychotic agent (Oldman) who murdered her family. Download Léon: The Professional in Digital HD from the iTunes store. Léon: The Professional images are © Columbia Pictures. All Rights Reserved. 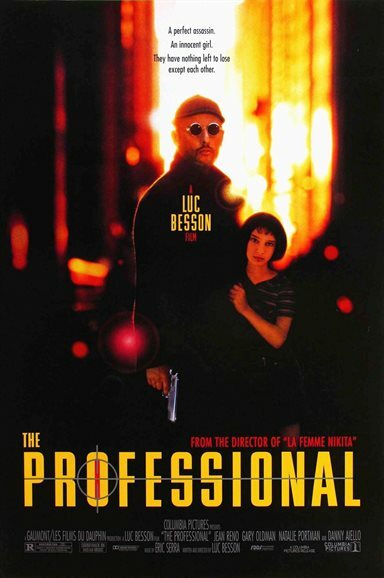 Luc Bessson (La Femme Nikita) has been writing and making films since the early 1980's but in 1990 he became more of a household name with the release of Leon: The Professional and The Fifth Element. Highly stylized action films, they captured the imagination like none others had before. With his latest film, Valerian and the City of a Thousand Planets, hitting theaters this month, a few of his more well-known films are being released on 4K Blu-ray including Leon: The Professional. Leon (Jean Reno; Mission: Impossible) is a professional hitman; a "cleaner" if you will. He lives a solitary, lonely life and seems to like it that way. He lives in a small apartment in New York City and mostly keeps to himself save the 11-year-old girl, Matilda (Natalie Portman; Star Wars: Episodes I, II and III) who lives down the hall. Every so often they engage in a short dialogue and then Leon retreats once again to his apartment and his lone plant. That plant, in a terra cotta pot, is the only thing he seems to truly care about. That is until the one day fate puts Matilda in his path. Matilda lives a lonely life as well except she is surrounded by people. She lives with her father, step-mother, half-sister and her younger brother. She is constantly criticized and getting in trouble. However, one day when she goes on an errand to the store she comes home to find her family dead and some bad men searching for her. She later comes to find out one of those men is the crooked D.E.A. Stanfield (Gary Oldman; The Dark Knight Rises). Forced to live on the run, she enlists Leon's reluctant help. Ultimately though they become a strange little family and start to care for each other, willing to make sacrifices for the other. Besson's voice is definitely unique and distinct in everything he writes and directs. His stories tend to be ones of hope disguised as tales of woe and despair. His decidedly French influence is obvious in everything from angles and costumes to the music chosen for his films' soundtracks. Leon: The Professional is no different, which is part of what makes it such a classic movie loved by audiences around the world. Besson's casting choices in this movie are excellent in this film which is part of what gives it such strong teeth. Reno is perfectly cast as the illiterate, loner assassin and his gritty exterior belies the soft, warm, mushy center he possesses underneath. Oldman's Stanfield is crazy and slightly unhinged, again, with an outer coating of a polished politician. Watching him play this role is an education in a master class in acting. Portman, in her first major film role, plays a decidedly adult character trapped in the body of an 11-year-old girl. She has a tough outer layer but is secretly somewhat afraid on the inside. Besson tends to write his characters with many layers and talents actors need to be prepared to take on the complexities of the roles, something Reno, Oldman, and Portman do beautifully. The 4k is presented in 2160p video with an HEVC/H.265 Codec and an aspect ratio of 2.39:1. The blacks are true and deep while the greens of the foliage offer shades of green making them pop. The Dolby Atmos audio is strong with the special effects, gun shots and bomb blast dedicated to the outside channels while the dialogue sits nicely on the center channels. The combination allows the viewer to enveloped in the action. The Combo pack has the 4K Blu-ray disc, a regular 1080p Blu-ray and a digital code for download. The grouping offers a few special features including the Directors extended cut that has additional scenes, not on the original US release. The other features are previously released material that has cast and crew reminiscing ten years after the original release of the film in 1994. If you are a Luc Besson fan you no doubt already own his best movies on disc but the release of those in 4K will make you want to upgrade your collection. 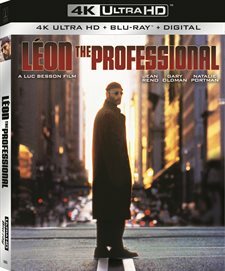 Leon: The Professional 4K UHD is currently a Best Buy exclusive release and can be purchased by clicking here.